You can use the SharedSizeGroup property of a ColumnDefinition to lead to consistent column sizes in a ListBox with a data template. This works because each entry in the list has its own instance of a Grid and the column sizes are being shared across different grids. As a more general example, we can share column sizes across two Grid controls hosted in the same window. 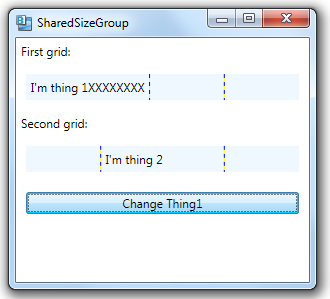 We share size between the first column in the first grid and the second column in the second grid, since they use the same value for SharedSizeGroup. Thanks a lot for this sample! Important for me was to have 2 grids within same parent StackPanel and set Grid.IsSharedSizeScope=”True” directly on that parent StackPanel. 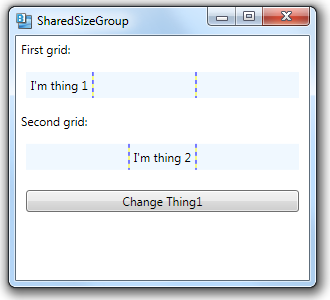 I have the wrong way on both Grids and it does not share sizes. Now it works well!